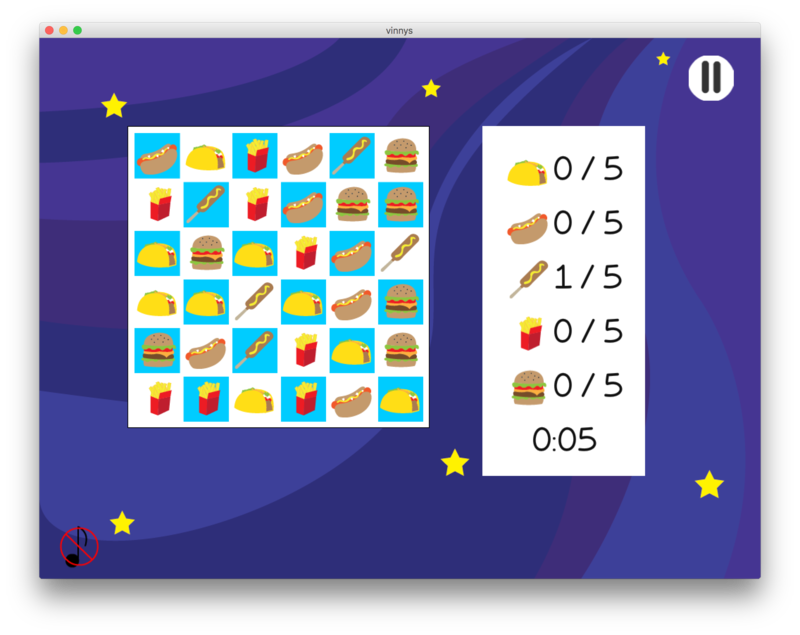 Vinny’s Snack Shack is a time trial match three game that I just wrapped up. 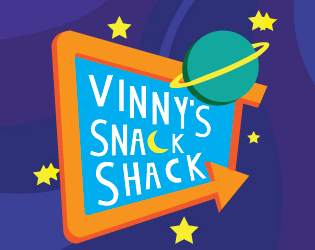 You can check it out on itch.io at https://lukehut.itch.io/vinnys-snack-shack. 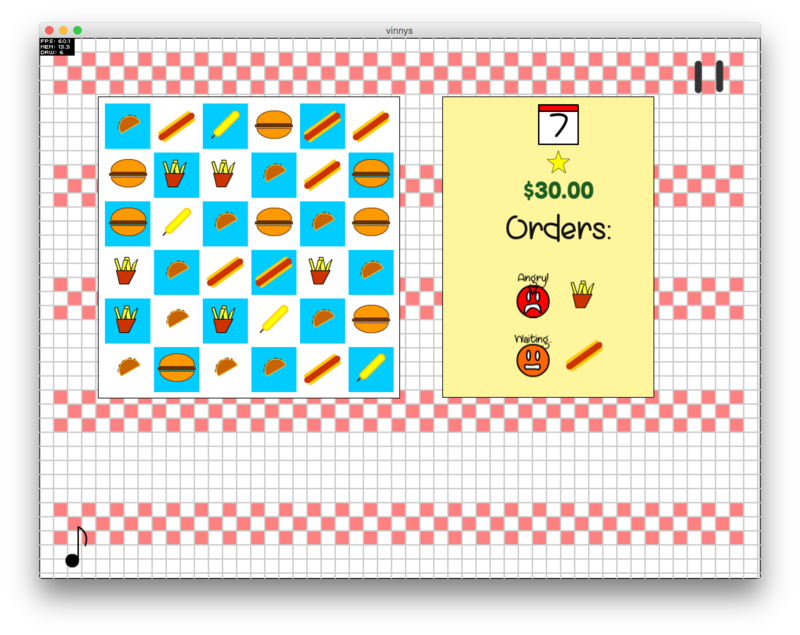 I'm super happy with the results and how much better it looks than my programmer art; collaborating with artists is definitely something I hope to do on more projects. It's pretty focused on OS X development and not AIR, but I was able to translate the semantics well enough to understand where my data modelling had gone wrong and fix the problems I was having. This probably saved me weeks of development time and helped me dodge some problems down the road. I'm terrible for making silent games, and this project was no exception. When I realized that there were no sounds for anything that happened while you were playing, I decided to fix the problem and recorded my own sound. I've got this filed under both "what went well" and "what didn't go well" because even though I have sound now, I wouldn't say that it's very good or great. Something to improve for next time. This led to a pretty protracted development period, because each time the theme or mechanics shifted I'd need to rework bits of the game (and even now, there is an entirely unused name entry screen sitting in the project files..). 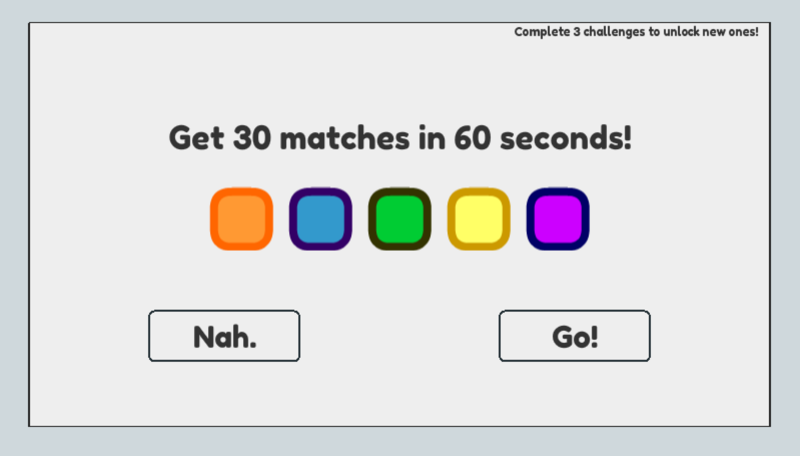 The problem was that most of them weren't fun or bite-sized enough to be doable, so I spent a lot of time iterating because my scope wasn't constrained enough or I wasn't sure which pieces of the game were "must haves" vs. "nice to have". It worked out (I finished the game), but as someone who builds games in their spare time scope management is an ongoing problem for me. Next time maybe I'll just use a game generator and commit to building whatever comes out. If you play the game (or watch the video! ), you can clearly tell that I am not a great sound person. While I was able to get functional sounds going for this project, I think next time it might help to talk to someone who knows more about sound work than I do to make sure that I don't have as many weird delays or volume issues. I'm pretty happy with how this project turned out - it was an opportunity to learn some new things (sound), collaborate with someone (art), and also build in a genre I've never built before. I also found at the end of the project that I was beginning to generate a lot of interesting ideas on ways to explore the match three genre a little further, or mash it up with others - it might be a little while before I come back to building match three again, but I'm glad that I've got this one under my belt now.